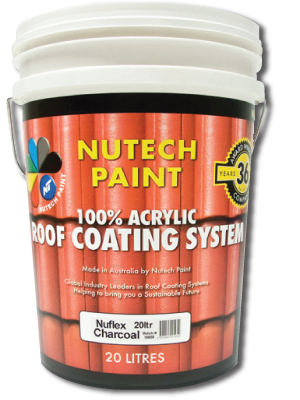 Since 1973 Nutech Paint has continued on their mission to develop the most advanced Cool Roof, White Roof, Silicone, Sealers and Protective Coatings solutions on the market. 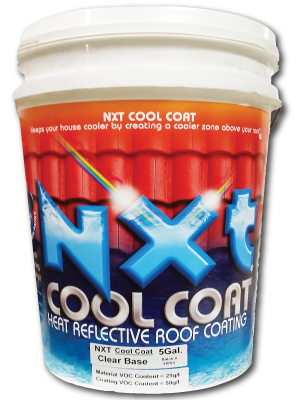 “Cool Roofs” coated with Nutech Paint’s NXT Cool Coat coatings will reflect light and heat away from your roof. On average, your roof will keep cooler by up to 86° F, meaning the inside of your home will be kept a comfortable 10-18°f cooler than outside temperatures. NXT Cool Coat Paint reflects between 30% and 91% of the sun’s heat. NXT Cool Coat Charcoal; our darkest coating color, has a Total Solar Reflectance (TSR) of 35% reflecting 500% more than conventional charcoal roof paint, on the other side of the color spectrum our NXT Cool Coat White has a TSR exceeding 90%. NXT Cool Coat Paint reduces summer cooling costs, peak energy usage, extends building life and will help reduce greenhouse gasses, global warming and landfill usage. When it comes to heat reflective commercial roofing solutions our NXT silicone flat and modified roof coating outperforms the rest; Our white and gray silicone roof coating is a ready-to use, 96% solids, single component, moisture cure fluid applied silicone coating; because of its superior breathable membrane, NXT Silicone is guaranteed to not fail under ponding water and consistent severe weathering. NXT Silicone has a Total Solar Reflectance (TSR ) of more than 90% having a major impact decreasing cooling cost and heat stress to the buildings structure. NXT Silicone protective coatings can be applied to architectural surfaces such as vertical walls, masonry, concrete, metal, single ply membranes and sprayed-in-place urethane foam systems. TileFlex is a specifically formulated roof paint designed as a very high gloss roof coating option that will maintain the look of a new roof for much longer than a standard gloss roof coating. 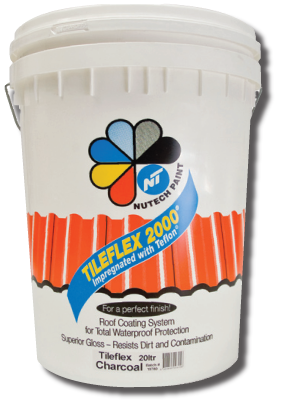 Tileflex is available in all 36 of our standard colors and incorporates Nutech Paint’s patented self-cleaning Nanotechnology; making TileFlex extremely algae and mold resistant, protecting the vital underlayment of any roof. TileFlex can be applied to Metal Roof, Asphalt Shingle, Concrete Tile and Fiber Cement Paint. Nutech Anti-Corrosion Water Based Acrylic Metal Primer is designed as a primer for new and weathered steel, galvanized, zincalume, aluminum, lead, copper and pre-coated metal sheeting. This primer is supplied standard in a mid-gray color or White suitable for top coating with all Nutech Paint’s top coatings. Asphalt Primer is an Acrylic water based special purpose primer designed to seal and adhere to asphalt roof surfaces including asphalt coated shingles, shakes, cap sheets and liquid asphalt and bitumen coated roof structures. Formulated from high quality adhesion promoted acrylic resins, Asphalt Primer resists asphalt bleed through and top coat blistering to ensure superior Nutech topcoat performance. Water-based, easy cleanup. Apply with brush, roller, or airless sprayer. NuPrime is an extremely fine particle size, wet adhesion promoted acrylic primer coating designed for powdery roof tiles and concrete surfaces. Its technically advanced formula promotes deep penetration ensuring top coat adhesion. NuPrime is a non-yellowing clear primer that is fully compatible with surface binding and all Nutech top coat systems. 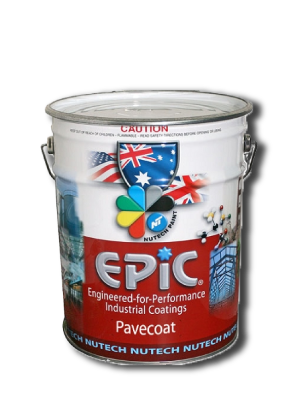 Nutech Paint’s Aqua Stop single pack silicon concrete, masonry and terracotta sealer has been developed for alkaline and non alkaline building materials to impart water repellency to absorbent materials. The sealer is water dilutable and produces rapid surface water repellency producing a beading effect within a few hours and complete curing within 24 hours. 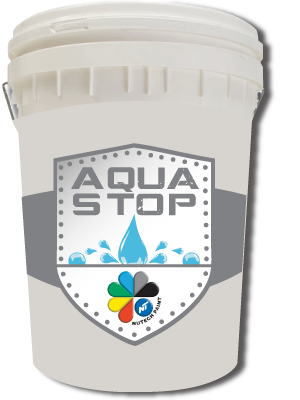 Aqua Stop physically and chemically bonds to the surface, lengthening substrate life, reducing biological growth and dirt pickup and making cleaning easier to reduce maintenance costs. Aqua Stop is formulated to minimize darkening effects (wet look) as not to change the appearance of the substrate. Testing on all substrates is recommended before commercial application. Pavecoat seals and protects concrete providing a durable surface ideal for pedestrian and light vehicle traffic. Nutech paints Pavecoat provides an attractive finish for new and old concrete. This protective coating is available in clear or any of our standard 36 colors. Pavecoat may also be custom tinted, and comes in a choice of low sheen, semi-gloss, and high gloss finishes. Pavecoat concrete sealers are manufactured from acrylic polymer resin and are stable for all types of concrete paving such as, driveways, factory and workshop floors, service stations, tilt slab construction, asbestos and cement sheeting, slate flooring, and concrete roof tiles. Pavecoat is highly durable and resistant to oil and most household chemicals.